Hannibal Buress measures success inch by inch. IN GESTURE Buress in a rare hands-on moment. Not many comedians headline Zanies at the age of 25. But not many comedians have the patience, tenacity and pinpoint humor of Hannibal Buress, who has a marquee slot Tuesday 11 and Wednesday 12. In only a few years, the Chicago native has gone from open miker—defending his name from cannibalistic inferences (it’s actually derived from a general from Carthage born in the year 247 BC)—to a nationally recognized new practitioner of observational comedy. 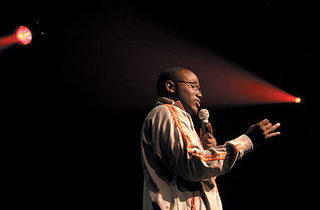 Yet there was no meteoric ascent from obscurity; Buress’s rise happened one step at a time. Buress seems like the kind of guy who takes his time. His jokes start slow and often quite vaguely. “I’ve got weird aspirations, like I want to kick a pigeon,” starts one bit, then the comedian pauses. The deliberate, almost-monotone voice, coupled with the sight of Buress standing still and gazing glass-eyed into the distance, has you wondering where the hell this is going. He continues: “ ’Cause pigeons walk around like they own the place.” Without moving, Buress adds that if people saw his deed, they’d tell all their friends about it. In extreme deadpan, he mentions the next day’s inevitable newspaper headline: “Black dudes are kicking pigeons.” Other jokes about late-night pawn shops and “the next big blind guy” enjoy a similar slow build. 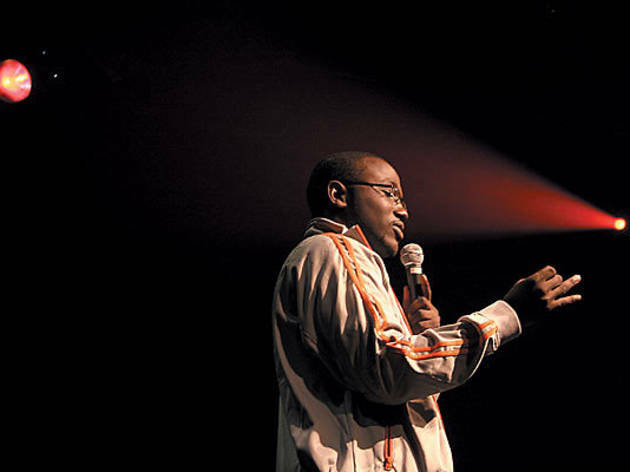 Upon returning to his parents’ house after college in 2005, Buress attended as many open mikes as he could without owning a car. One year and countless sets later, he secured a spot in the prestigious New Faces Showcase at the annual Montreal Comedy Festival. He started hustling bookers shortly thereafter and began making the rounds as an opening act. The next year he worked his way onto the Late Late Show with Craig Ferguson and won TOC’s Funniest Person in Chicago award. Opener gigs became feature ones, and being a contestant in Comedy Central’s online Open Mic Fight contest paved the way for a spot in the network’s Live at Gotham showcases last July. Having moved to New York just three weeks ago, Buress continues to spend his days e-mailing with club managers and talent scouts, hoping it leads to the next big thing. His headlining gig at Zanies will surely help—and those who attend will witness a more industry-ready Buress. The cadence has quickened, the number of pauses reduced, and his delivery now incorporates hand gestures. It’s all just a subtle shift, of course; Buress will make it big but, as always, will do so little by little. Buress stands alone Tuesday 11 and Wednesday 12.